Projecting bridge cranes (a.k.a. telescoping bridge cranes) are under hung cranes (single or double girder) that have a secondary bridge that projects beyond the end of the bridge beam. 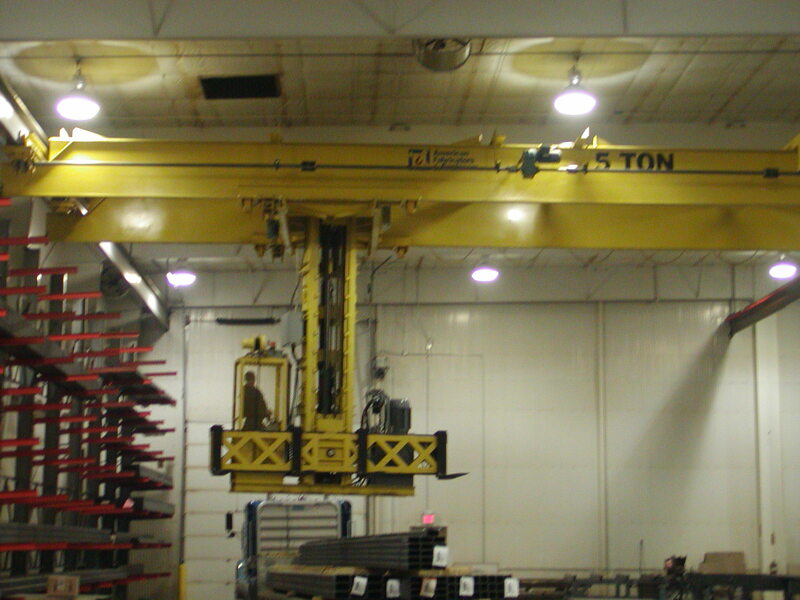 A projecting crane can extend beyond a support or building column to lift material in an adjacent bay, and then retract so that the crane can pass by the column. 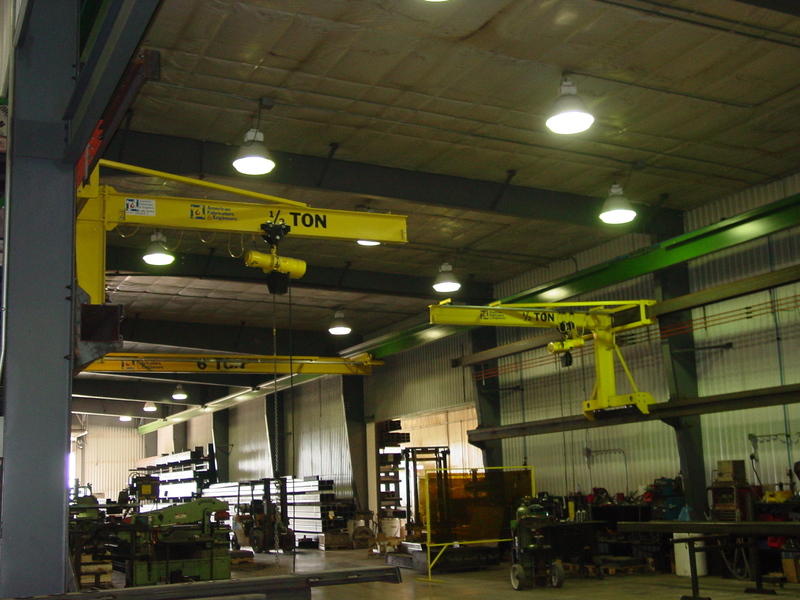 These cranes typically only project in one direction but can be designed to project in both directions to maximize the use of the crane. Truss cranes are built using a single bridge girder supported by two trusses. 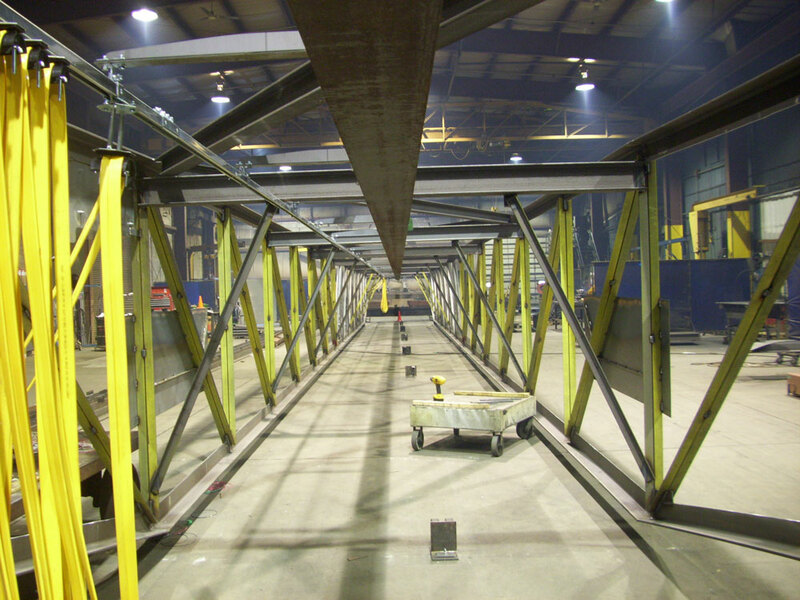 The trusses allow the span of the crane to be up to 125’ and capacities up to 5 ton. Typically, truss cranes require more headroom than a conventional bridge girder. 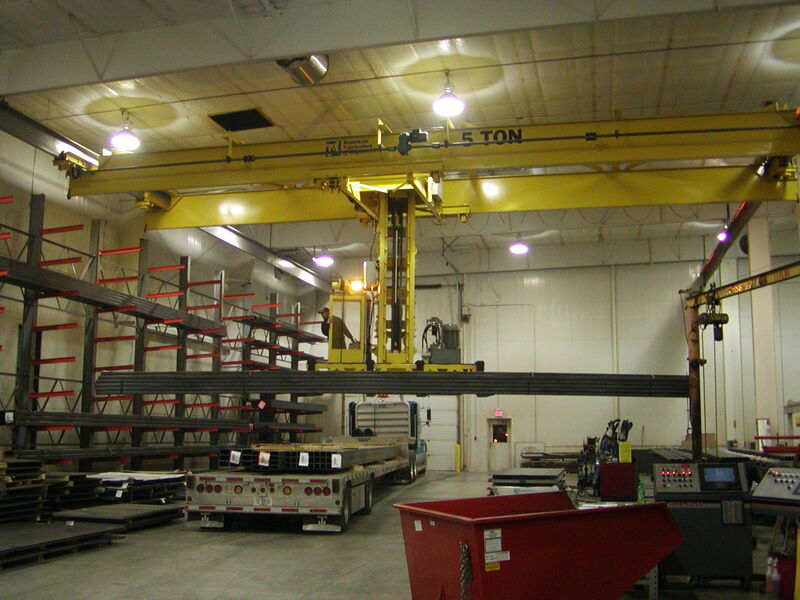 The required amount of headroom is dependent on the crane span and capacity. 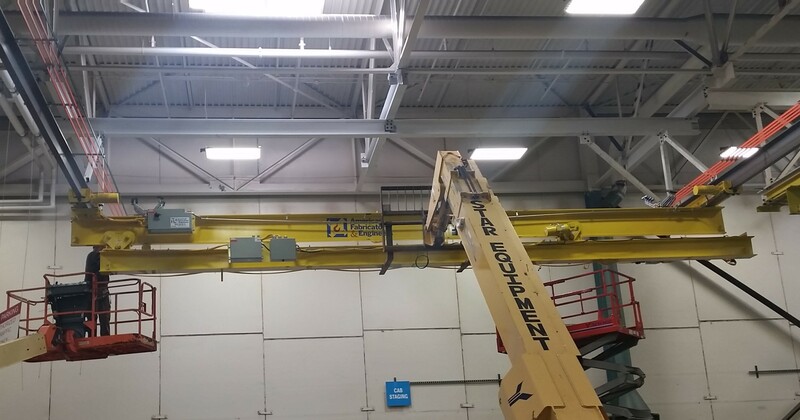 Similar to double girder cranes, the hoist/trolleys used in truss cranes are mounted between the two trusses keeping an excellent high hook. 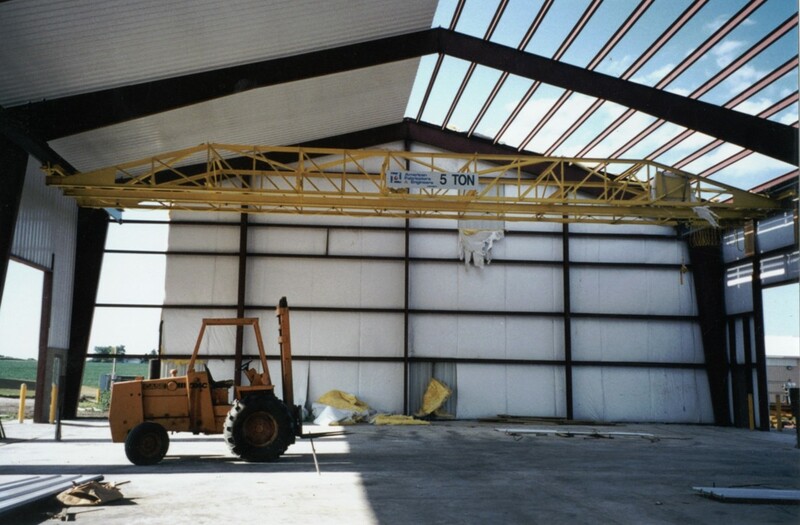 Compared to an equivalent box girder beam, truss cranes require less material allowing runway and support structure to use less material and cut costs. 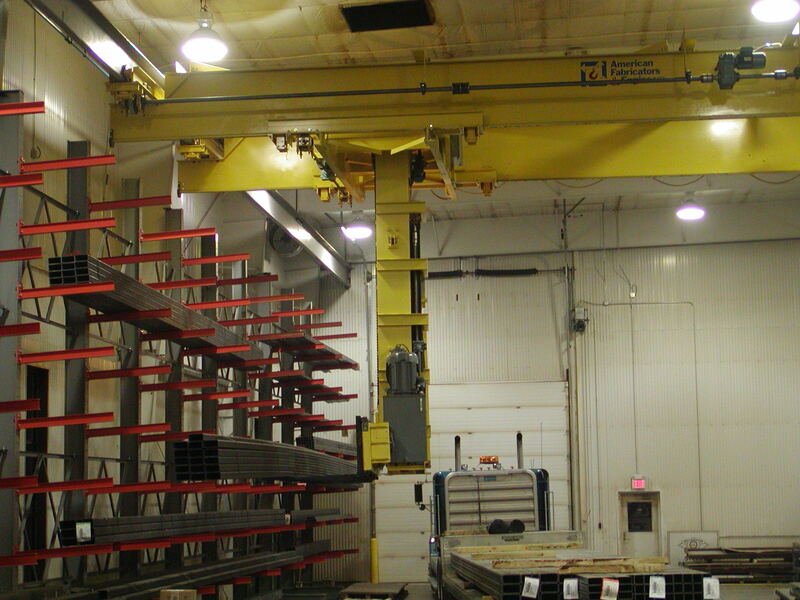 A truss crane can be built in a top running and under hung configuration, but typically always use an under hung hoist/trolley. In some applications, a castellated structural beam is preferred over a truss. 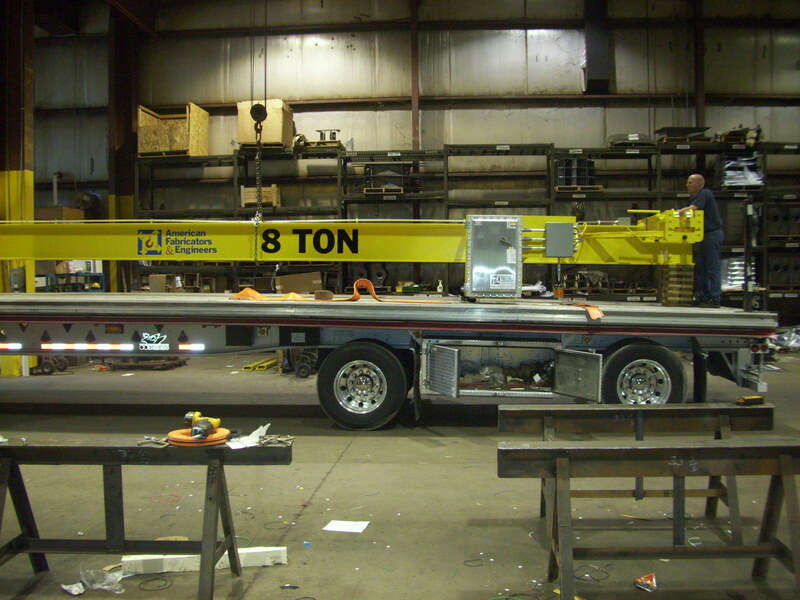 A wall traveling jib crane is the combination of a jib crane and an overhead bridge crane. 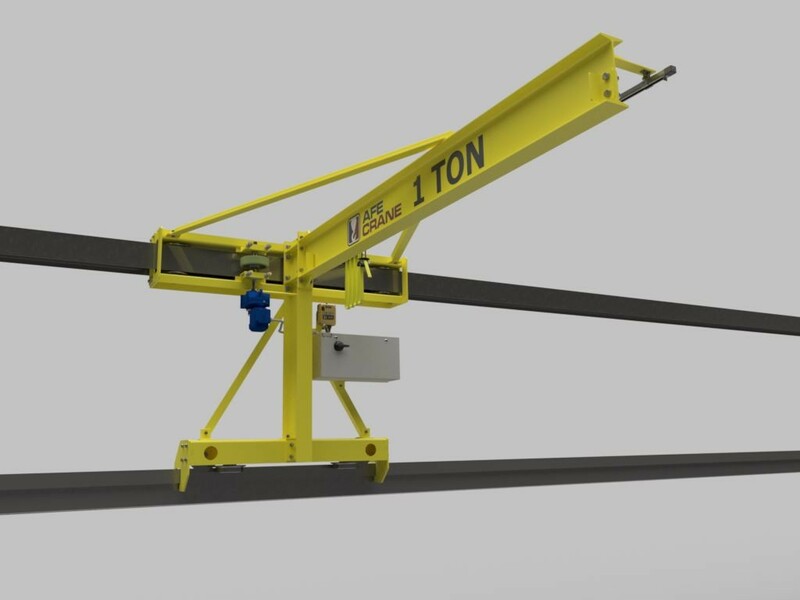 Wall traveling jib cranes have a cantilever boom but rather than having a fixed floor mounted base, it travels along a runway mounted on the wall. 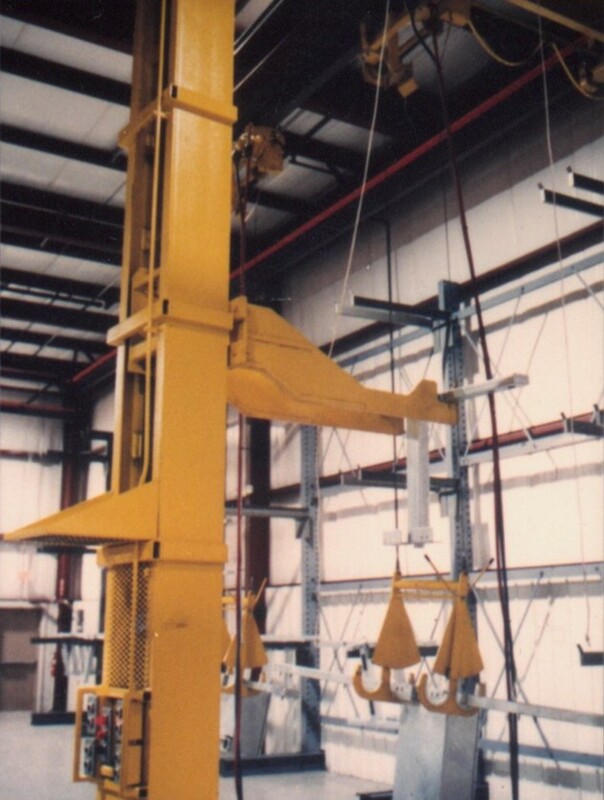 The primary advantage of wall traveling jibs is having more hook coverage area than a conventional jib crane due to their rotation motion. 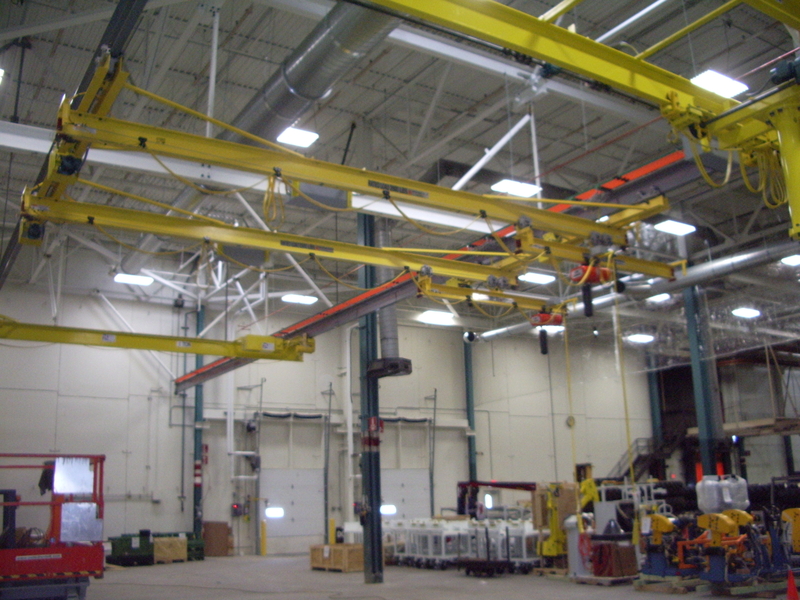 Wall traveling jib cranes also allow work pieces to easily travel down a series of workstations without switching from jib crane to jib crane. 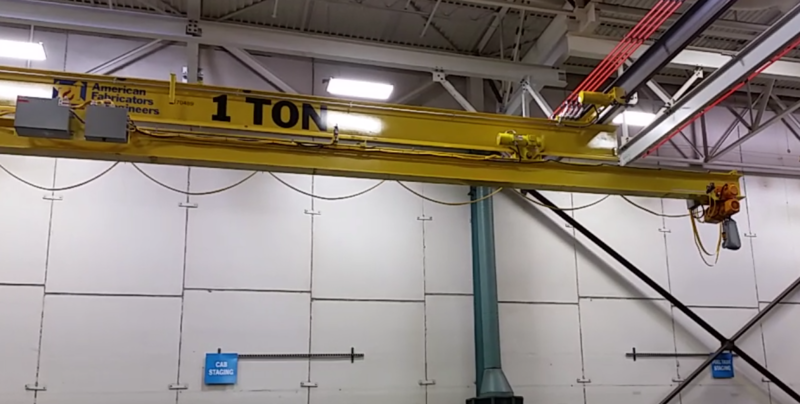 Since the runways for wall traveling jib cranes are mounted off the wall, there is typically room above it for a bridge crane to pass overhead just as with any other type of jib crane. 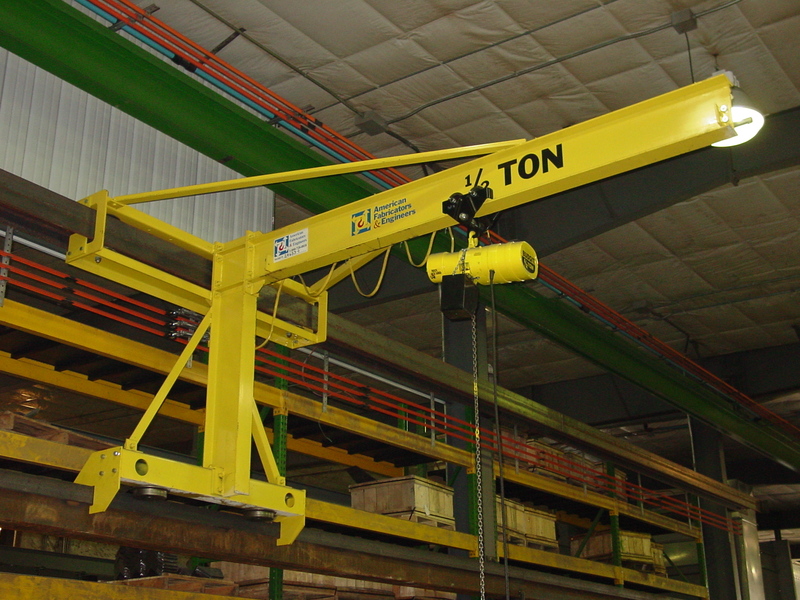 Stacker cranes are typically a double girder (under hung or top running) crane but without a hoist. 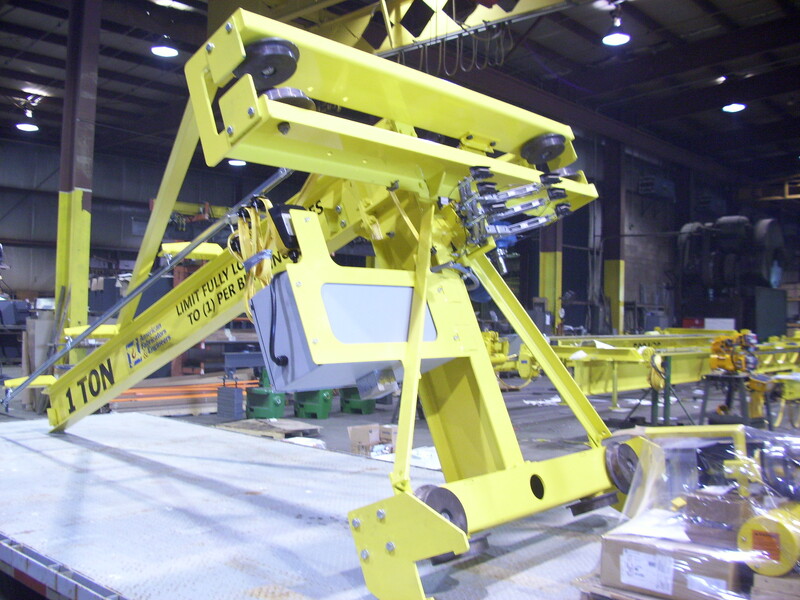 A special carrier and telescoping mast assembly are built in place of the hoist. The carrier allows the mast assembly to travel the length of the bridge. 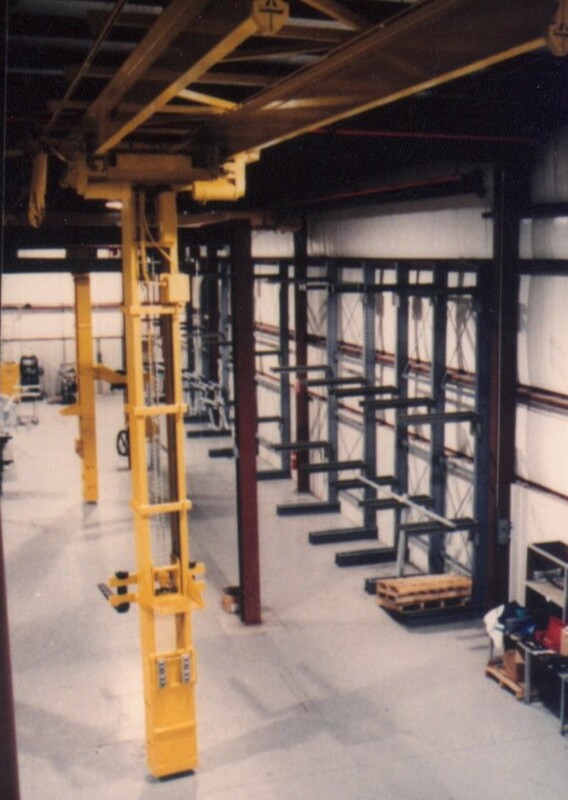 The telescoping mast works very similar to a mast on a forklift. Typically, forks are attached to the bottom of the mast allowing pallets, sheet material and even long structural members to be moved and placed in racking. 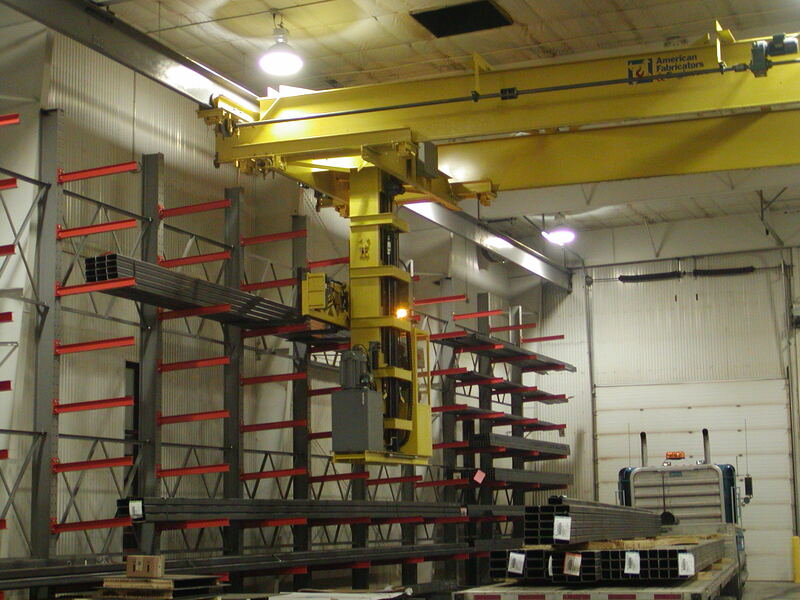 Stacker cranes are a safer means of unloading, rotating and storing long, unwieldly material than a conventional overhead crane or ground driven forklift. 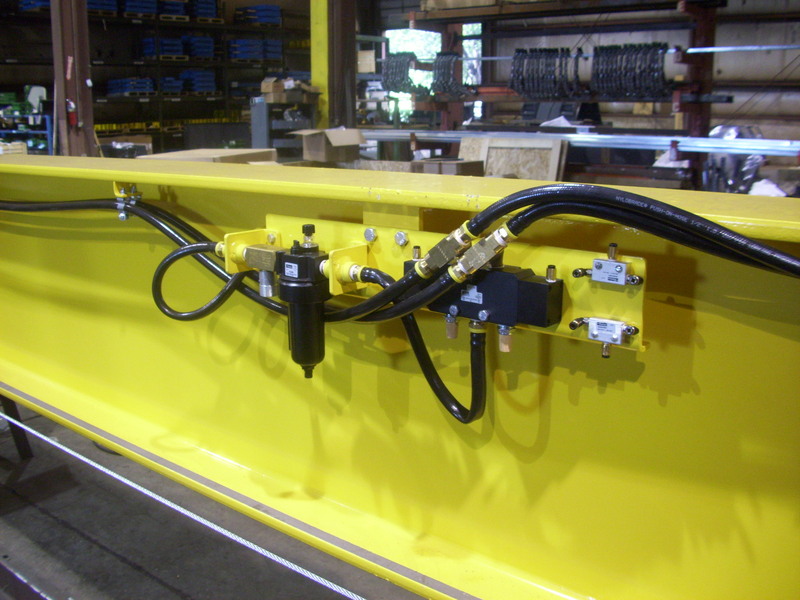 AFE crane can build many types of cranes that are designed to be installed in special environment areas. These areas include, but are not limited to, wash-down/outdoors, food grade, caustic & hazardous environments and hot metal cranes. 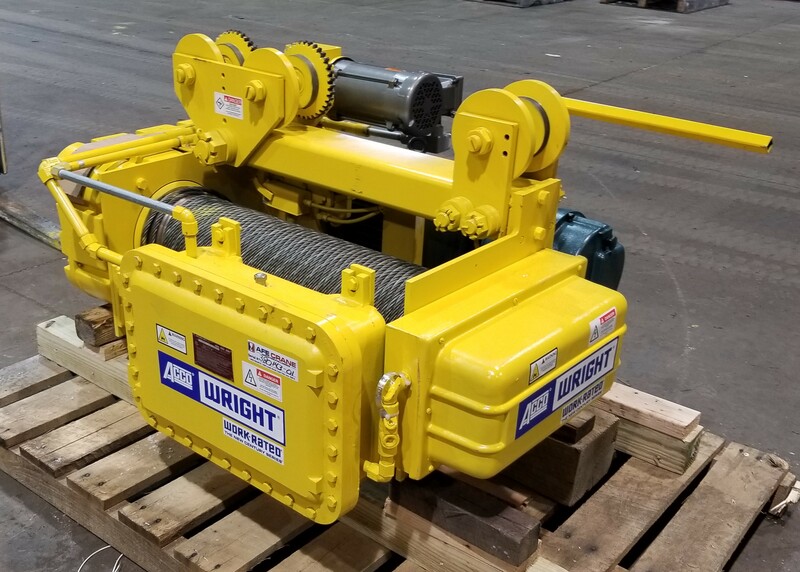 Depending on the environment special materials such as brass, stainless steel and galvanized steel will be used to ensure all specifications are met. 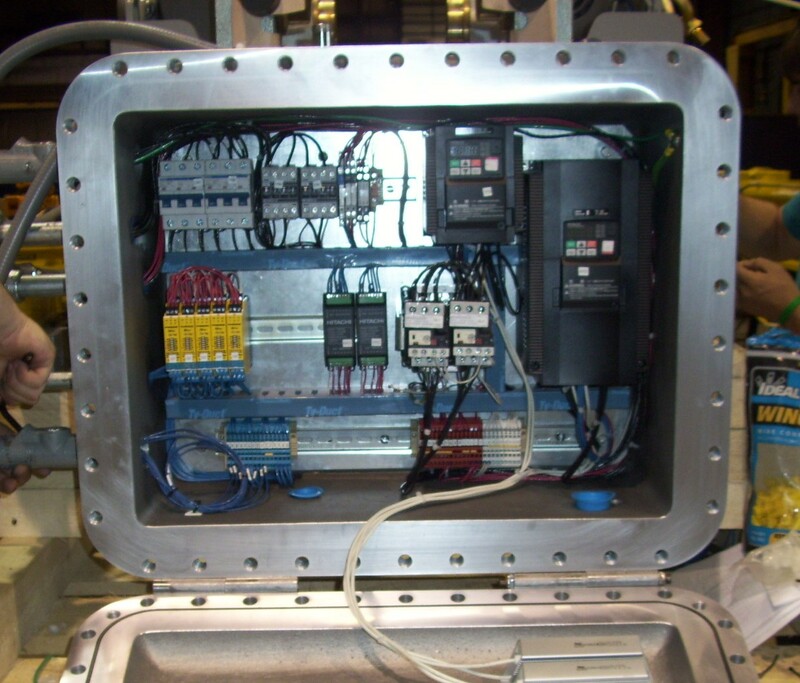 For hazardous environments (i.e. 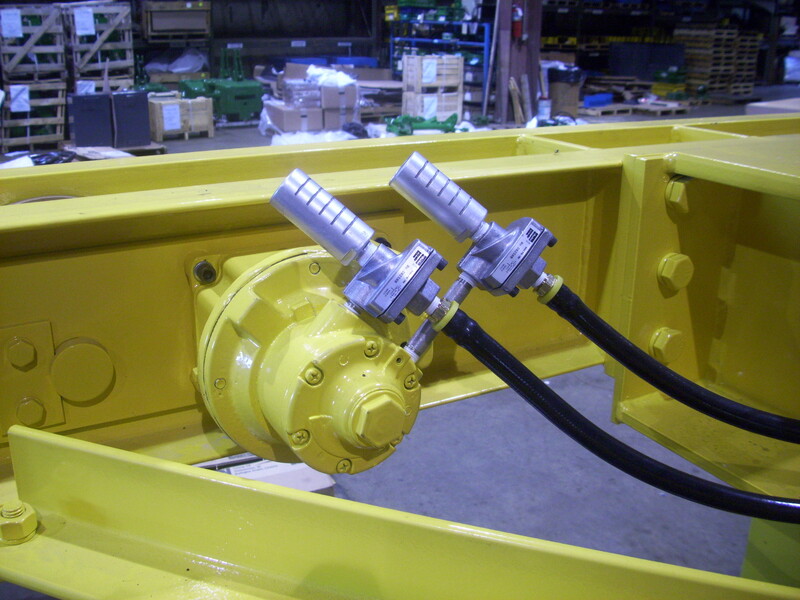 explosive gasses, dusts and fibers), AFE crane follows the wiring practices defined in the National Electric Code. 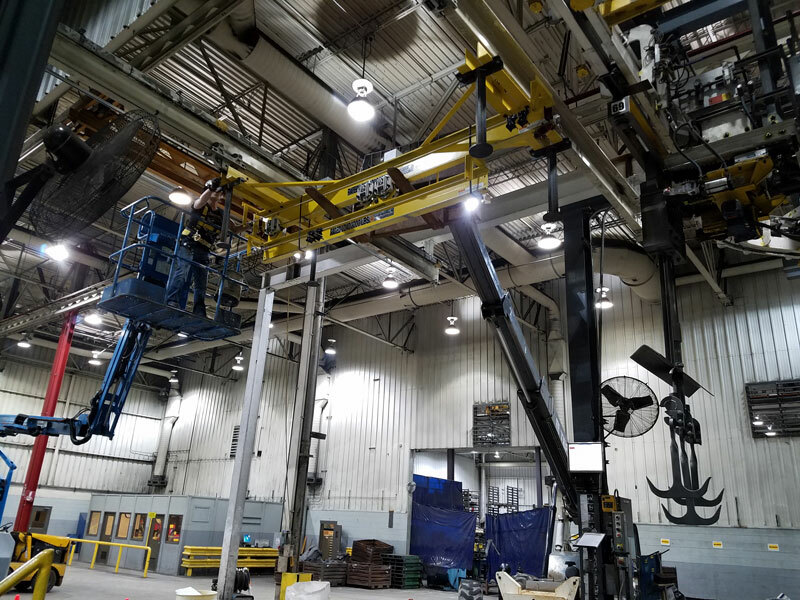 When designing cranes for foundry’s and other hot metal areas special precautions need to take place during the design phase to ensure a structurally sound crane system. 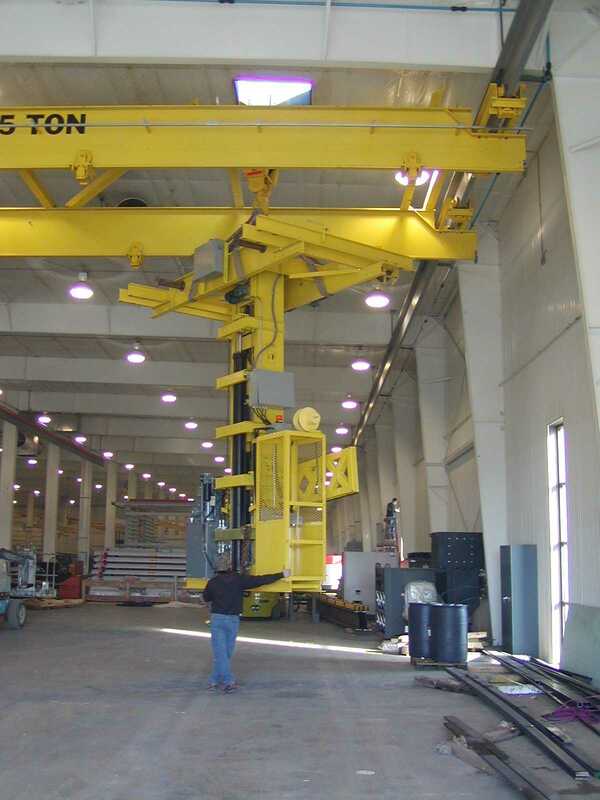 A gantry crane is a top running (single or double girder) crane with one or more end trucks running at floor elevation. 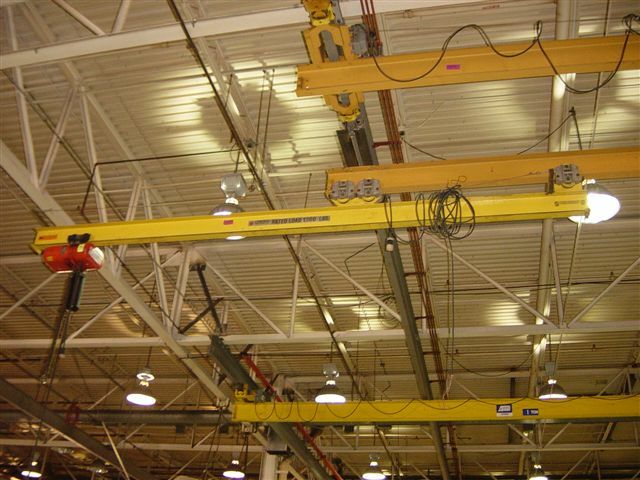 A typical gantry crane (fixed leg gantry crane) uses two end trucks running on rail mounted on the floor. The end trucks have legs that support the bridge beam(s). 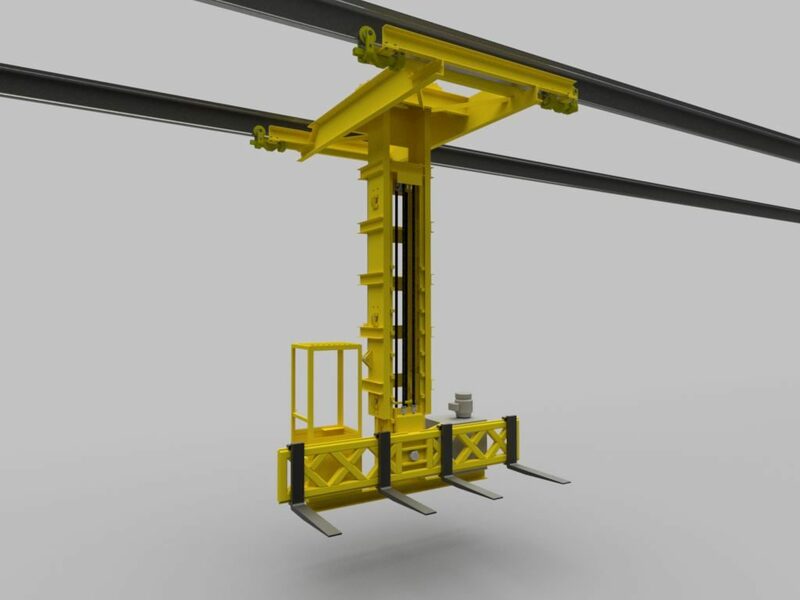 Another style of fixed leg gantry crane is known as a single leg gantry. 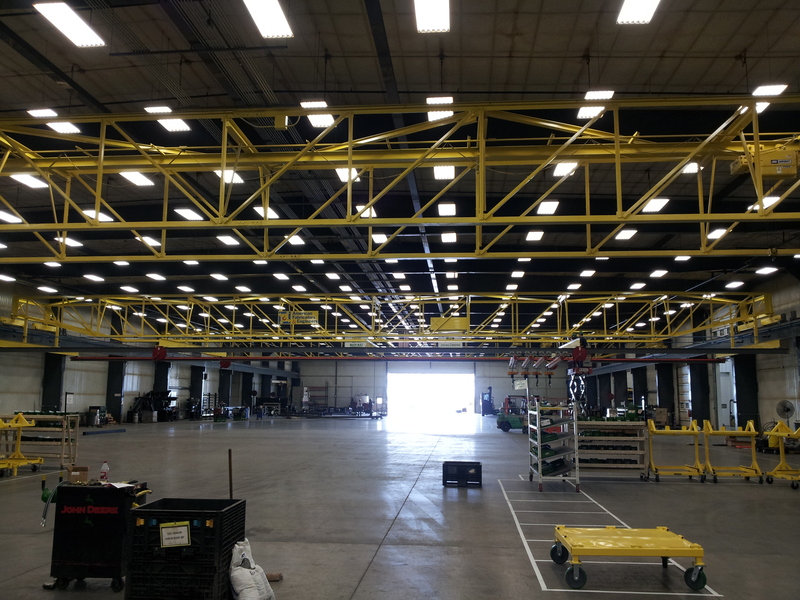 Single leg (semi) gantry cranes have one floor running end truck and one end truck running on an overhead runway beam. 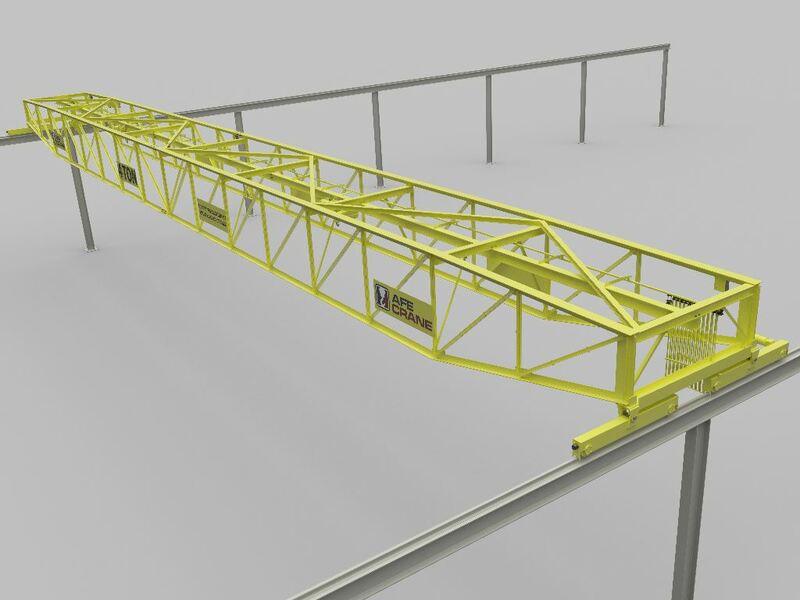 Gantry cranes can be built with spans up to 55 ft and capacities up to 15 ton. 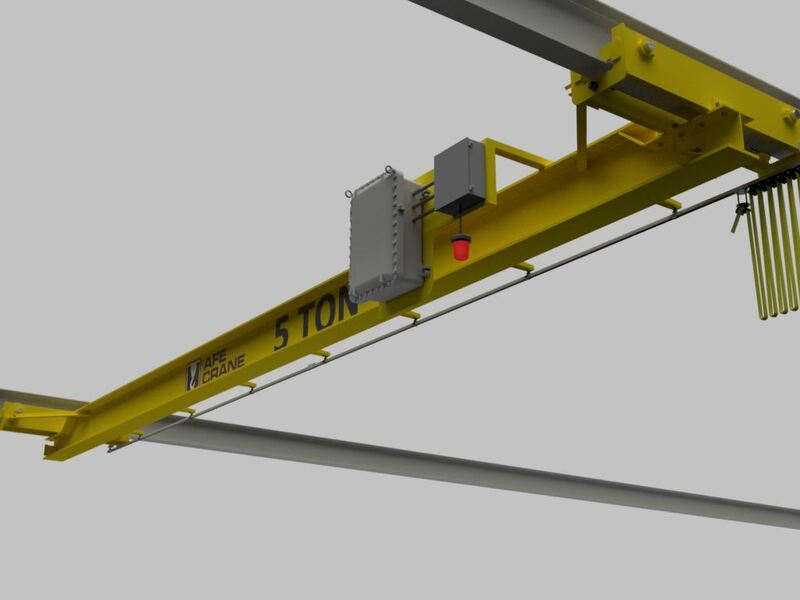 The overall height of gantry cranes is typically 30 ft or less. 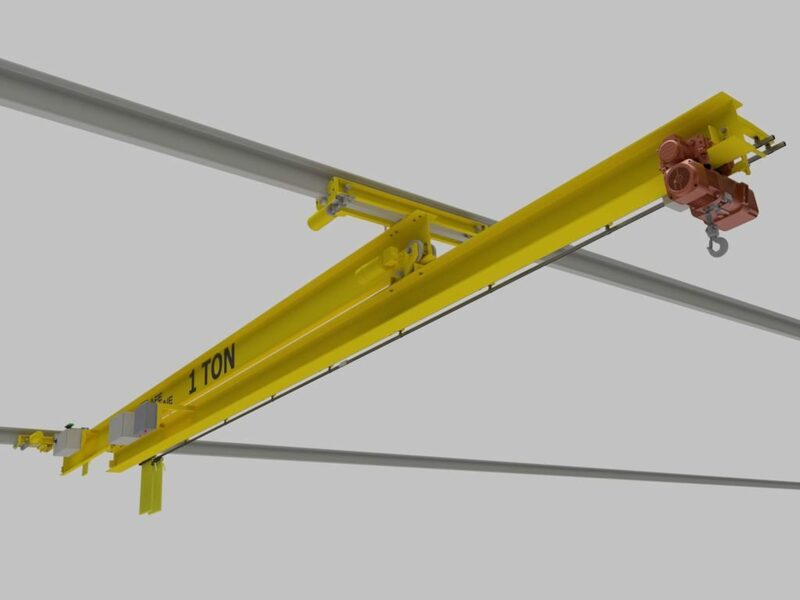 If the coverage area is not predetermined, a portable gantry crane may fit the application best. 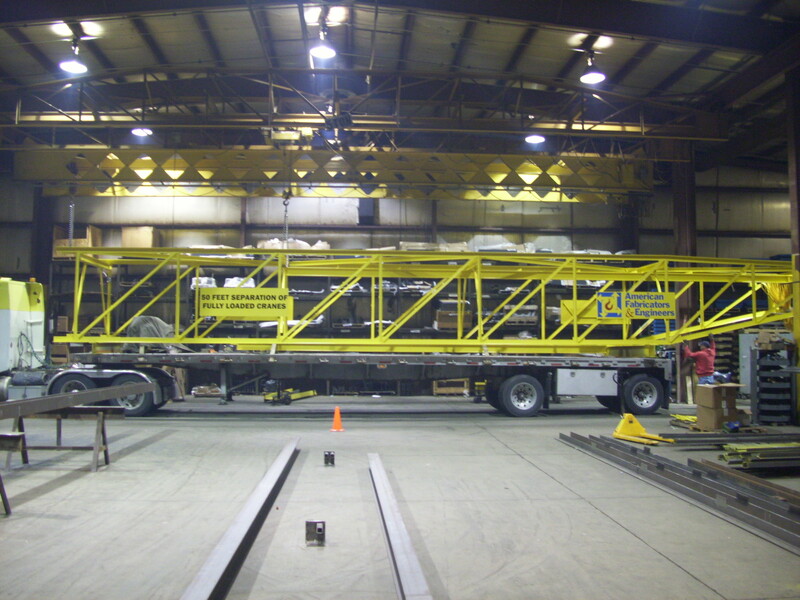 Portable gantry cranes can be quickly disassembled and reassembled in new locations. 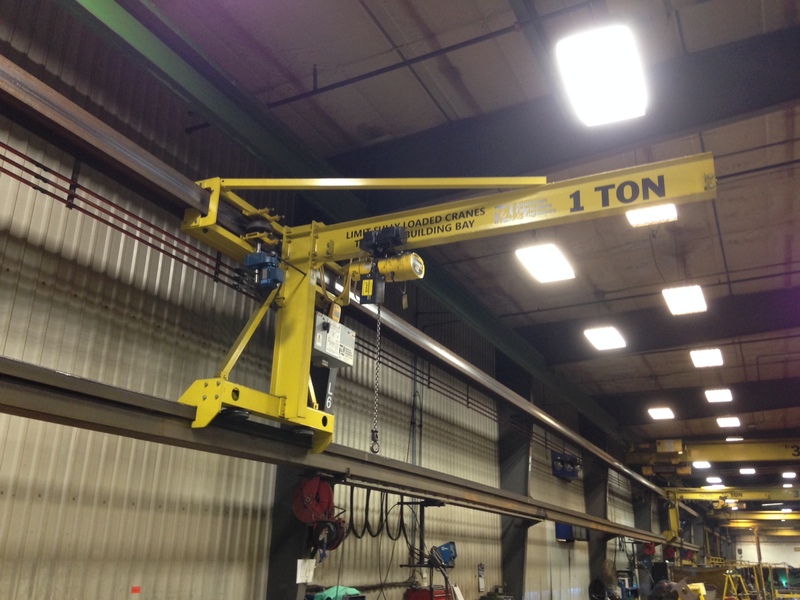 These cranes are typically mounted on top of caster wheels. 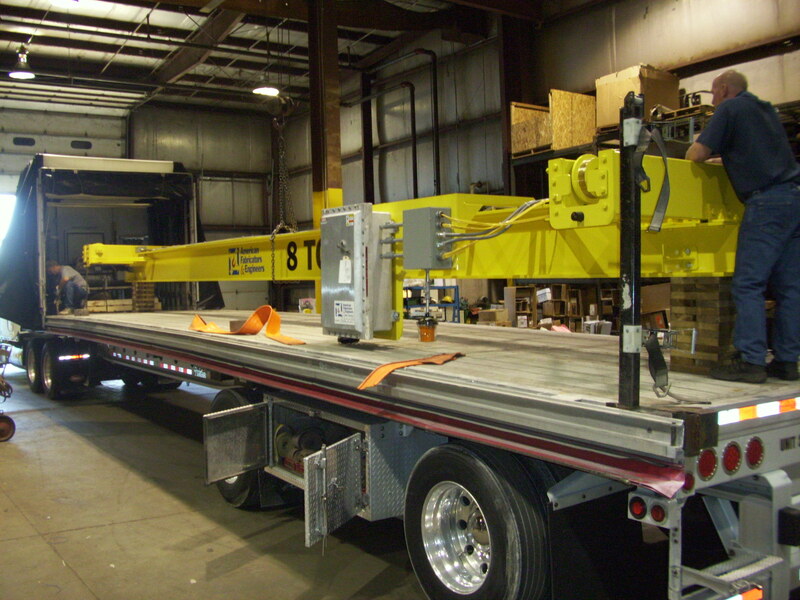 Typically, portable gantry cranes are compact so they can be used in tight spots and stored out of the way.